This page has been converted from the Fedora Project Wiki and cleaned up for publishing here on the Fedora Docs Portal, but it has not yet been reviewed for technical accuracy. This means any information on this page may be outdated or inaccurate. Reviews for technical accuracy are greatly appreciated. If you want to help, see the README file in the source repository for instructions. Fedora’s default desktop environment is GNOME 3 in the Workstation spin, but it is very easy to try any of the many other desktop environments that are available without affecting your current desktop environment. Install the desired desktop environment as described in Installing additional desktop environments. On the login screen, select a user from the list. Click on the Preferences icon right below the password field. A window appears with a list of several different desktop environments. Choose one, and enter password as usual. Run the Desktop Switching Tool application. Select the default desktop from the list of available desktop environments, and confirm. See the switchdesk(1) man page. Alternatively, edit the /etc/sysconfig/desktop file as root. This file specifies the desktop for new users and the display manager to run when entering runlevel 5. GNOME — Selects the GNOME desktop environment. KDE — Selects the KDE desktop environment. 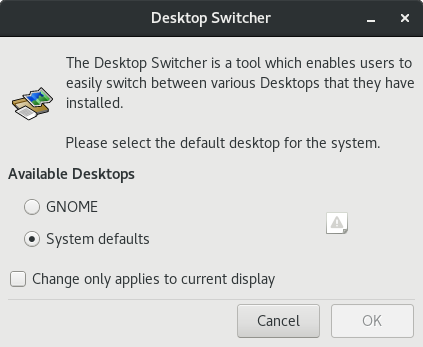 GNOME — Selects the GNOME Display Manager. 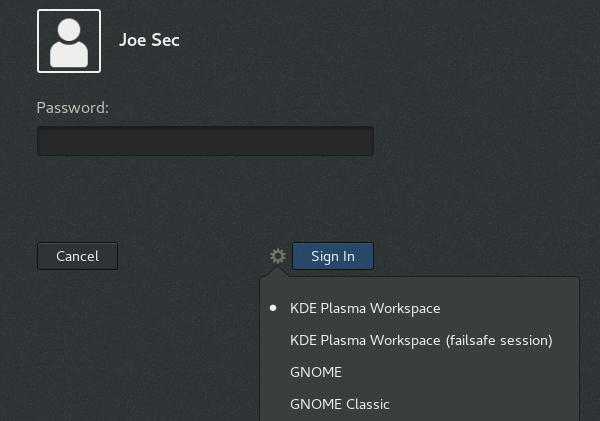 KDE — Selects the KDE Display Manager. XDM — Selects the X Display Manager.